Maurice Malpas sitting in the directors’ box probably saw Hibs create more chances today than they did during his and Terry Butcher’s entire tenure, but incredibly despite dominating thoughout, Alan Stubbs’ men could only take one point against Raith Rovers after Christian Nade grabbed a last gasp equaliser to counteract Martin Boyle’s earlier strike. Head Coach Stubbs made one change to the starting XI that beat Queen of the South last week, with new on-loan signing from Dundee United, Keith Watson taking over at right back from Callum Booth who was told last week that he would not be offered a contract at the end of the season and elected to move to Partick Thistle on loan. Former Hamilton Academical keeper Tomas Cerny started on the bench alongside Jordon Forster who continues his comeback from injury. Franck Dja Djedje was also listed amongst the substitutes after missing the last two games with a hamstring injury. Before the game, there was a minutes’ applause in memory of former Hibs’ Chairman Douglas Cromb who passed away last week. 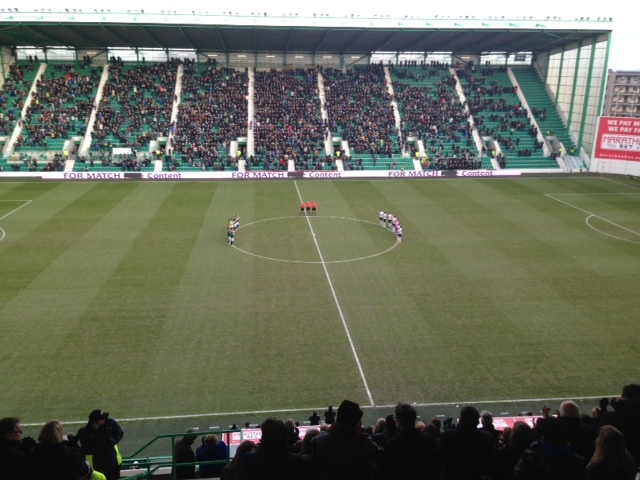 Hibs started brightly in freezing cold conditions and spurned three good chances in the first two minutes. Liam Craig went close with a header from a Watson cross, then Martin Boyle had a shot blocked before Liam Fontaine headed inches wide from a Craig cross. The home side dominated possession,sometimes holding the ball for two minutes without a Raith player getting a touch as they looked to grab an opener. In the 23rd minute, Craig’s free kick was flicked inches wide by Fontaine then Watson’s goalbound shot was blocked on the line as Hibs pressed for an opener. Four minutes later Boyle should have scored after the excellent Scott Allan found him unmarked eight yards from goal, but his shot was well saved. Craig then should have done better from a Lewis Stevenson cross but his header from five yards flew just past the post. Two minutes later, Craig found Jason Cummings who turned and shot first time from the edge of the box but with the keeper beaten the ball rebounded off the post. Craig then headed just over from an Allan cross and shot inches wide from a McGeough pass then just before the half time whistle his jersey was blatantly pulled inside the box but the referee waved away the fans’ and players’ appeals and he left the pitch with boos ringing in his ears. The breakthrough finally came in the 46th minute when Boyle beat the offside trap and latched onto a fine through ball from Allan before calmly slotting the ball home to register his first goal in the green and white of Hibs. Cummings should have doubled Hibs’ lead five minutes later after a great run by Allan but his shot was well saved by David McGurn. A great run by Fontaine almost created a second but shots from Cummings and Boyle incredibly stayed out. In the 72nd minute, a Liam Craig strike from the edge of the box was parried by McGurn and Boyle headed in the rebound but his effort was ruled offside, then ten minutes later, a sensational pass by Allan reached Boyle but the on-loan striker elected to shoot when Djedje was in a better position and the keeper made an easy save. With the game heading to injury time, Rovers won a corner on the right. Ryan Conroy sent in perfect cross and Nade headed the ball into the net to the delight of the travelling support.